My name is Autumn White Eyes and I met Eduardo Misael Najera Ortega during our sophomore year at Dartmouth. We were both pledging multicultural Greek organizations at the same time. 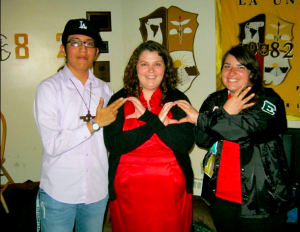 Eduardo is a brother of La Unidad Latina, Lambda Upsilon Lambda Fraternity, Inc. a historically Latino Fraternity, while I am a part of Alpha Pi Omega Sorority, Inc., a historically Native American sorority. Eduardo’s fraternity, and my sorority are often involved in co-sponsoring events together, and this is how I got to know Eduardo better. I’ve seen Eduardo grow into leadership with Lambda Upsilon Lambda Fraternity, in which he is now the president. This fall, his fraternity organized the Noche Dorada event on Immigration Reform, and Eduardo told his story of his struggles with migration. I was blown away by Eduardo’s speech and I could not believe so many of these stories go untold. Eduardo has an amazing story in which he takes a journey from rural Mexico to East Los Angeles, finally making his way to Dartmouth College. After hearing his speech at Noche Dorada, I wanted to know more about his story and had the pleasure to interview him for my Oral History project. Eduardo tells the story of his struggles of moving from a rural area to an urban one, as well as challenges he faced because of his undocumented status, and the implications of what this means for his education. Please take the time to read this story of an undocumented student. Eduardo’s story will be told in his voice with the exception of this welcome page and introduction.